This morning marked a special occasion as we move the first of our team into our new building in Parnell – Te Ara Turoa. 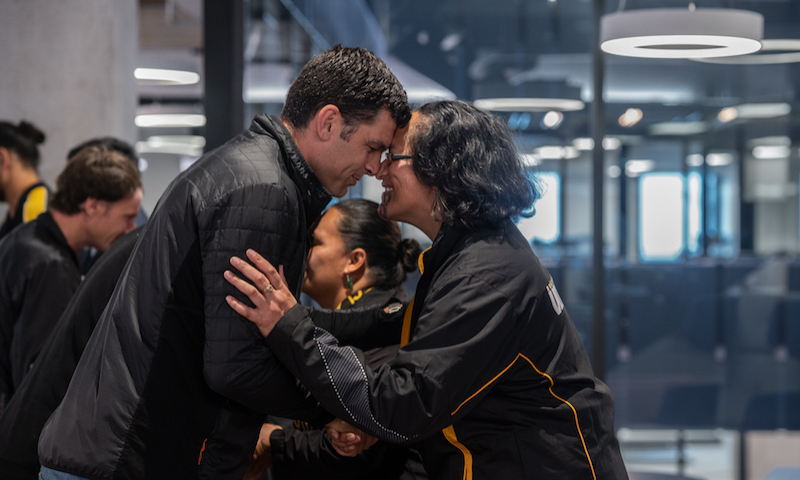 We were honoured to have Ngati Whatua Orakei bless the building for us and approximately 50 Xeros joined in as we moved through the levels, participating in the karakia where appropriate. After this was completed we all came together in the main area on level two for the mihimihi. I thanked Ngati Whatua Orakei and the team sang a waiata – â€˜e toru nga meaâ€™. Finally, we were invited to hongi and break bread together – which which we were told completed the process of connecting the spiritual world to our physical world. It was a moving experience and a fitting way for us to enter our new building. The kaumatua also spoke about the history of the area and how it came to be. This played a huge part in why we decided to name the building Te Ara Turoa and itâ€™s worth noting the meaning behind it. We wanted to give the building a name thatâ€™s both unique to us and our surroundings, so we reached out to the local Iwi to find out more about the land our building is built on. Looking at a map they provided us, we noticed that the building is right between three important Pa sites and the bay was a main trading and Waka launch site. Â Itâ€™s not hard to imagine people living, walking, fishing and building communities right on the location where the building now stands. One could imagine this whole area being a place where trade and commerce were conducted between Maori, and later between Maori and European settlers. Then, as we reflected on the role fishing played in the area (and that it likely formed the basis of a lot of trade), considered the three surrounding marae, Waipapa, Pukekawa and Tauraraua and thought about the significance that Waka have played in the naming, establishment and history of those sites – we started to see a naming idea come together that aligns really nicely to Xero and Mana Whenua. Â We decided to name the building after a Waka. From our perspective we see the Waka as a metaphor for our organisations journey out into the world, and in this case from the shores of Tamaki out into the Hauraki then out into the world. It represents all the daring and endeavour inherent in navigating a vast ocean, and the genius and knowledge required to reach our destination safely. Knowledge steeped in craftmanship of the carvers who constructed the vessel and in the navigators who using the stars, winds and tides to guide their people successfully throughout their known world. For that reason we named our building Te Ara Turoa – the journey of enduring light. The post The Blessing of Te Ara Turoa appeared first on Xero Blog.